The Central Weather Bureau (CWB) issued heavy rain warnings around southwestern and central Taiwan tonight. The affected areas include Taichung, Nantou, Yunlin, Chiayi, Kaohsiung, Tainan, and Pintung. Kaohsiung and Pintung are under extremely heavy rain warnings. First- and second-level flood warnings have been issued in parts of Kaohsiung and Pingtung. Level one warnings were issued for Xiaogang, Qianzhen, Qijin, Sanmin, Niaosong, and Fengshan districts in Kaohsiung, as well as Pingtung City. Level two flood warnings have been issued for Renwu and Lingya districts in Kaohsiung. Sections of Kaohsiung and Pingtung have seen over 150 mm of rainfall today. Areas with a level two flood warning may flood in the next three hours if the rain continues. Those in the first level warning may have already flooded. There is also a reservoir overflow warning for Nanhua Reservoir in Tainan and Liyutan Reservoir in Miaoli. Thunderstorms in Kaohsiung have already caused problems on roads with minor landslides. 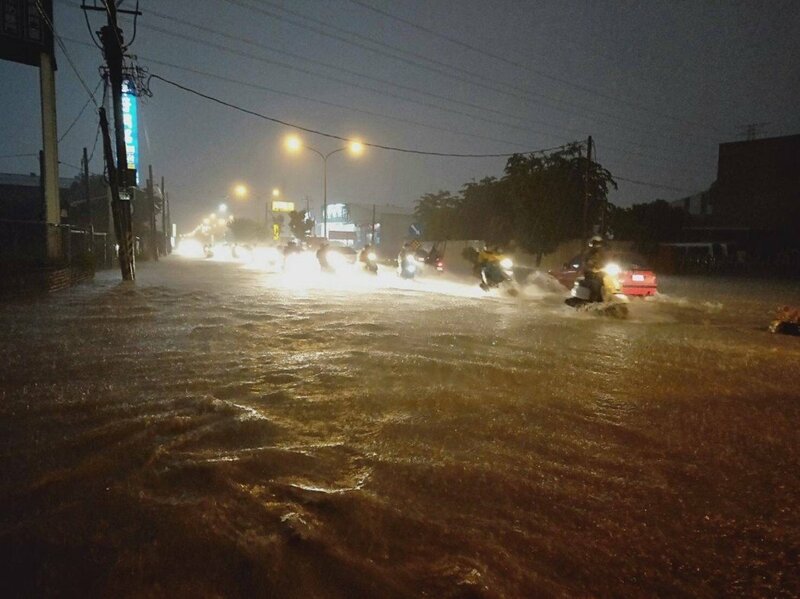 Shennong Road in Niaosong District, Kaohsiung was flooded at around 7 pm tonight. More than 4000 households are currently without power due to the storm. In addition, Kaohsiung International Airport had to suspend flights due to the heavy rain and damage to the runways, UDN reported. At about 9:30 pm, cleanup efforts at the airport began. The runway closure affected 30 flights, including 10 departures, and more than 1000 passengers.